Vehicles pass the welcoming sign to Belmont Shore on Second Street in Long Beach. Photo by Thomas R Cordova. With residents’ frustration mounting over crime and loitering issues in Belmont Shore, a pre-dawn march to “take back” the neighborhood will take place Friday. The march was organized by Barry Vince, a resident of Belmont Shore who said that the march is being organized to fight back against theft and vagrancy in an attempt to improve the quality of life for residents by making the neighborhoods safer for families. It will begin at 5 a.m. The group will move west down Second Street before looping back along the beach in an effort to show that the residents of Belmont Shore are keeping a close eye on their neighborhood. He said there’s been an increase in property crime, public drug use and even people exposing themselves in public as they urinate and defecate in public spaces. The patrol, which he hopes will become a weekly occurrence in Belmont Shore, is meant to help stem the flow of crime to his neighborhood as a supplement to a police force that he says often has its hands tied. In his statement, and through a number of social media posts, Vince has tried to differentiate the criminals he hopes this march will push out of Belmont Shore and those experiencing homelessness who he said he would “like nothing more” for them to get help. Vince said that as a recovering alcoholic himself, he is sympathetic to the needs of those down on their luck, noting that some of the people in his Alcoholics Anonymous meetings have come off the beach themselves. He said he will work hard to educate his neighbors both on the efforts underway by the Long Beach Police Department (bike patrols in the middle of the night, beach patrols looking for illegal bike chop shops) and the intended target of the patrols: criminals. Vince said he’s received hundreds of emails expressing interest in attending Friday’s march, and he’s hopeful that the event will go off without issue. However, he’ll be ready to pull the plug on it if it starts to go sideways. DeDe Rossi, executive director for the Belmont Shore Business Association, will be in attendance. She said she feels there is an uptick in people who look like “they don’t have any place to go” showing up in the neighborhood over the past year. A coffee shop on Second Street recently had its front window broken, an act that she says happens every once in a while. Rossi said generally the presence of LBPD officers tends to keep things in check during the day, but most of the issues she’s heard of have been occurring in the early morning hours. 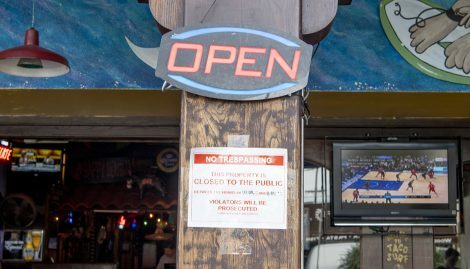 To prevent damage to businesses, those with patios have been instructed to turn their power off to prevent people from charging cell phones after hours and a number of businesses have started posting temporary no trespassing signs, which allow for LBPD officers to intervene in disputes with businesses asking people to leave the premises. Rossi said she’s remaining neutral on the march. She noted that in the past six months she feels things have gotten better. However, she worries of what the perception of tomorrow’s march could do for business. While the police department has seen an increase in calls to report homeless people in the area, Long Beach Police East Division Commander Patrick O’Dowd said overall crime is down this year in Belmont Shore’s reporting districts. From Jan. 1 through Sept. 30, Part I crime, which includes violent crimes and property crimes, dropped 15 percent compared to the three-year average, for a total of 198 crimes in the area. Part II crime, which includes lesser crimes such as vandalism and drug offenses, dropped 27 percent this year compared to the three-year average, for a total of 98 crimes. Click here to see crime stats in your neighborhood’s reporting district. Officers can cite or arrest people for camping on the beach after 10 p.m., but there’s not much police can do during the day since being homeless “isn’t a crime,” he said. In some cases, officers’ hands are tied by state laws, like the law permitting people to sleep in cars parked on the street if the city doesn’t have a permanent alternative, such as a homeless shelter or designated parking lot, O’Dowd said. “Our hope is the city will be able to come up with a shelter contract because without a shelter in place it’s going to be difficult to enforce some of the laws,” he said. For now, the department has two new programs to add patrols to the area. Starting Thursday, two officers will patrol the East Division on bicycles three nights a week from 9 p.m. to 7 a.m. The department also is in the process of training two officers to patrol the beaches on all-terrain vehicles during the day. A 53-year resident of Belmont Shore, Vince said that it’s a great place to live and he’s not going anywhere. He’s hopeful that one day the city might be able to afford more police to help patrol the area. Until then, the neighborhood patrol will work to supplement the department’s efforts. “Until we get more policemen and until the police get more control on this stuff, I just think we need all hands on deck to try and help out,” he said.